Background: Genetic instability generates somatic mutations which are mostly controlled by the immune system but defects in the T-cell system accompany higher cancer incidences. T-cell responses to tumor-associated antigens (TAA) including neoantigens, oncogenes and viral proteins depend on binding and proper presentation of TAA-derived peptides by human leukocyte antigen (HLA) class I (HLA-A, B, Cw) and II proteins (DR, DQ, DP). Particular HLA antigens and their combinations (haplotypes) may facilitate immune escape of cancer caused by their inability to bind and present such peptides to T cells. We recently demonstrated a link between HLA alleles and haplotypes (HLA-traits) and the development of head and neck squamous cell carcinoma (HNSCC) and varying progression-free survival (PFS) of HNSCC patients. Methods: We developed a HLA-score abstracting from complexity of HLA-typing results to facilitate potential use of HLA-associated hazard ratios (HR) for prognostic stratification. The HR for PFS of 8 HLA-traits shown to be independent predictors (Pi) of PFS in a test cohort (TC) of 90 patients were used to build the HLA-score based on the Pi-associated HR. Crude ln-transformed HR of the alleles HLA-B*13 (2), B*35 (1), B*51 (2), DQB1*06 (1), homozygous Cw (1), homozygous DRB4 (2), and haplotypes A*01/B*08 (-6) and B*08/C*07 (4), were summed up to define the individual patient’s HLA-score. 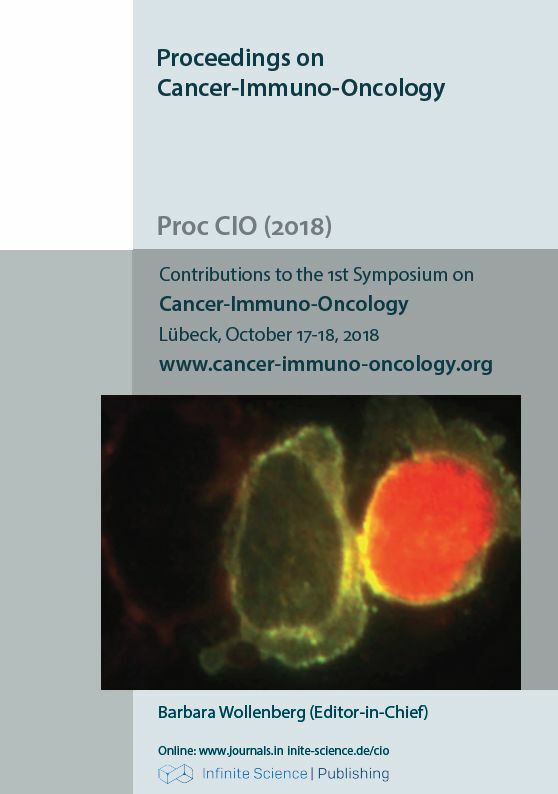 Results: Receiver operating characteristic (ROC; P = 0.0000034) and Kaplan-Meier curves for PFS demonstrated the prognostic significance of the HLA-score (AUC=0.750, CI 95% 0.665-0.836; 70/90 patients in TC with HLA-Score >0 had reduced PFS (P=0.001). Applying the same classifier (HLA-score >0) to an independent validation cohort (iVC) of 32 DeLOS-II patients confirmed these findings by demonstrating reduced PFS of 25/32 patients (P=0.040)[2). Recent research demonstrates that HLA-traits constitute critical Pi in other cancers (e.g. melanoma) and predicts response to immune-checkpoint inhibitors. Conclusion: Considering HLA for prognostic stratification could reduce outcome variance in clinical trials. The HLA-score may facilitate the use of genetic information from HLA-typing.